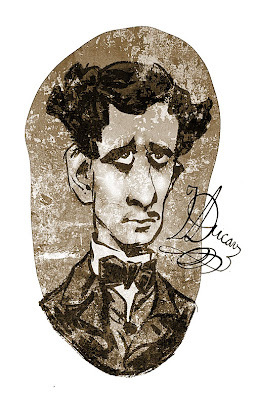 Yesterday I drew for a magazine this picture of the Uruguayan writer Isidore Ducasse, Comte de Lautréamont. "The Book of Late Afternoon"
Is there a publisher out there who would like to publish this book? ¿Hay algun editor por ahi que quiera editar este libro?